Arlington. Va. – Americans for Prosperity (AFP) on Thursday will launch a television and digital ad campaign in North Dakota informing citizens about Senator Heidi Heitkamp’s (ND) record of opposing tax relief for North Dakotans while giving billions of taxpayer handouts to special interests. 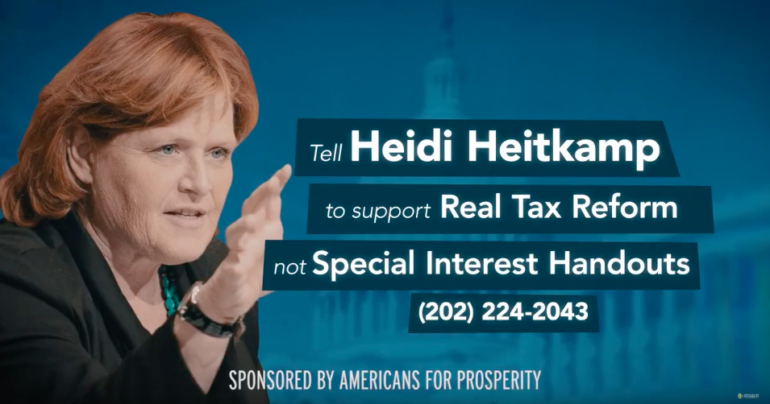 The grassroots group is investing almost $450,000 in TV and digital ads asking citizens to hold Senator Heitkamp accountable by urging her to support real tax reform for families over special-interest handouts. This North Dakota effort comes on the heels of AFP’s nearly $8 million investment on TV and digital ads in Indiana and Missouri holding Senators Donnelly (IN) and McCaskill (MO) accountable for their opposition to tax reform by urging them to support policies that lead to higher paychecks for Indiana and Missouri families. The new North Dakota ads will begin running on television and digital platforms Thursday and will continue throughout the coming weeks. “Senator Heitkamp has time and again voted to line the pockets of special interests, but when she had the chance to put more money back into the pockets of her constituents, she turned her back. “Now, instead of acknowledging the clear benefits of tax cuts that North Dakotans are seeing with their own eyes, she continues to put politics first and distort the facts. Hardworking Americans are already seeing the benefits of the Tax Cuts and Jobs Act as hundreds of companies invest in their employees and communities by creating jobs and increasing wages. Senator Heitkamp voted to deny individuals and families these benefits, choosing special interests over the well-being of citizens in their states. This ad effort is part of AFP’s campaign to hold accountable lawmakers who voted against the pro-growth reform. Last week, AFP launched a national grassroots campaign to bring its tax reform message from the airwaves to the grassroots. Called American Pay Raise, this long-term effort aims to thank lawmakers who supported the Tax Cuts and Jobs Act, hold accountable those who opposed it and urge Congress to protect tax reform benefits that millions of Americans are already experiencing. For further information or to set up an interview, reach Gabrielle Braud at GBraud@afphq.org or (571) 329-1846.